For millions of young Americans facing a chronic disease, the school nurse down the hall does much more than diagnose sore throats and upset stomachs. Today, school nurses hold an increasingly central role in coordinating care with parents, caregivers and students’ medical providers. The National Association of School Nurses (NASN) recently published an extensive study on how nurses throughout the nation’s 13,000-plus school districts are integrating the care of students with diabetes, asthma, food allergies, autoimmune diseases, epilepsy and many other chronic illnesses into their school’s responsibilities. According to the Centers for Disease Control and Prevention, about a quarter of the nation’s school children and adolescents have complex medical conditions that require daily management of health care services. In an effort to provide a healthy and positive learning environment, students with chronic illnesses depend on the support of a school’s teachers and licensed staff. The NASN report, Translating Strategies into Actions to Improve Care Coordination for Students with Chronic Health Conditions, identifies a clear link between the care school nurses provide for students with chronic health conditions and the overall positive health outcomes for these students. “Research suggests that students who receive direct health care and/or care coordination, have fewer visits to their urgent care centers, emergency rooms and health care provider. Also, fewer report the need of long-term hospitalization,” the report reads. 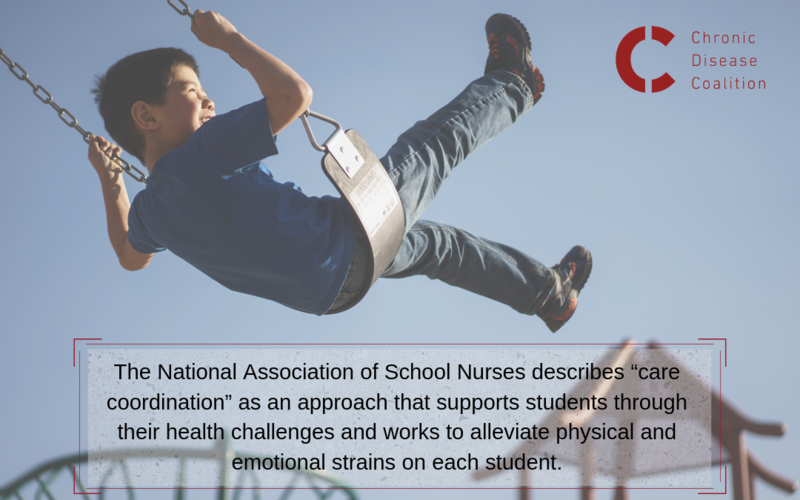 The comprehensive approach, what NASN calls “care coordination,” creates the foundational mindset for how nurses manage students with chronic health conditions. This approach supports students through their health challenges and works to alleviate physical and emotional strains on each student. “For the individual student, care coordination begins when a family accompanies the student to school with a medical diagnosis and health care provider (HCP) orders,” NASN Executive Director Donna Mazyck told the Chronic Disease Coalition. By creating a transparent and supportive environment, this approach works to destigmatize the conversation about chronic illnesses and encourages students to not feel defined by their disease. Tennessee school nurse Andrea Cain of Christiana Elementary, who was interviewed by WTVF-TV about her role in caring for students with chronic illnesses, described the challenges her students face. The NASN report highlights schools providing quality care to their students but also sheds light on the challenges many schools, districts and states face when looking to provide proper care with limited resources. The NASN urges schools and district administrators to support and encourage professional development for school nurses. By investing in school nurse education on how students’ unique health conditions can affect their learning environment, the overall health, education and emotional support of the students would benefit. ● Identify a process that supports a consistent flow of health information between the home and school. Tell families which school personnel are responsible for collecting and processing information, and obtain the signatures required for exchanging that information. Develop forms that are easy for families to understand. ● Connect families and students to community resources and partners such as camps, support groups, affinity groups and mental health and social services agencies. ● Provide continuity of care during times of transition, such as when a student changes grade levels or schools, moves between inpatient health care and school or experiences changes in their family’s structure. ● Talk with families about options for financial coverage of their child’s health care. ● Connect families with primary or specialty health care providers as needed. Help schedule health care appointments. ● Engage in community activities and identify resources that address social determinants of health that affect students and families such as access to care, health insurance, transportation, stable housing and sustainable food sources. The Chronic Disease Coalition supports this impactful initiative and is grateful for the school nurses who are developing proper care coordination for our country’s students. We encourage those within the entire community to share your story.